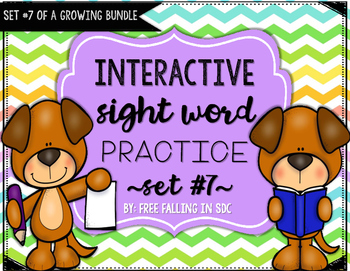 *an interactive page for each word that is introduced that gives students many different ways to practice the sight word. Students will decorate, trace, and write the word, dab the word, fill in the missing word (within a sentence prompt), write their own sentence with the given sight word, create an illustration that goes with their sentence, and find the sight word in a word search. These pages are great during centers, independent time, or even as homework! *Clip the sight word cards. Students read the sentence and clip the sight word that belongs. In addition, you can laminate the cards and have students write the correct sight word in the sentence. There are four different sights that are included in each card/picture. The students will be able to practice reading the same sentence and finding the correct sight word that is missing. *word wall cards that can be a great addition to your word wall. These can also be used as flashcards. I laminate these for durability. 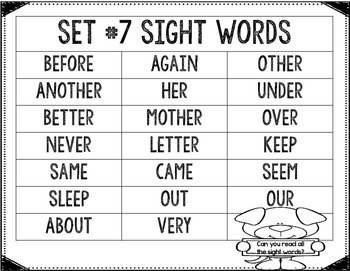 *Sight word scramble practice page. Students get to practice how to spell sight words correctly. Students use the word bank to help them unscramble the given word and they write it correctly on the line. An answer key is included. *Sight word sentences practice page. Students use the word bank at the bottom to fill in the sentence with the correct sight word. 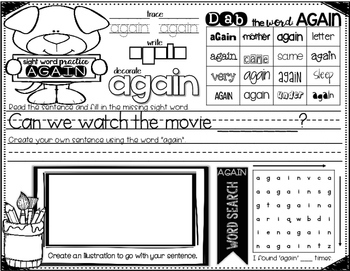 All sentences are decodable and/or use sight words that are included in this set. An answer key is included. *Color by sight word practice page. *If you see any mistakes please let me know and I will try to change it as soon as possible. *Borders, fonts, and graphics are all credited on the last page. These shops are amazing!! !